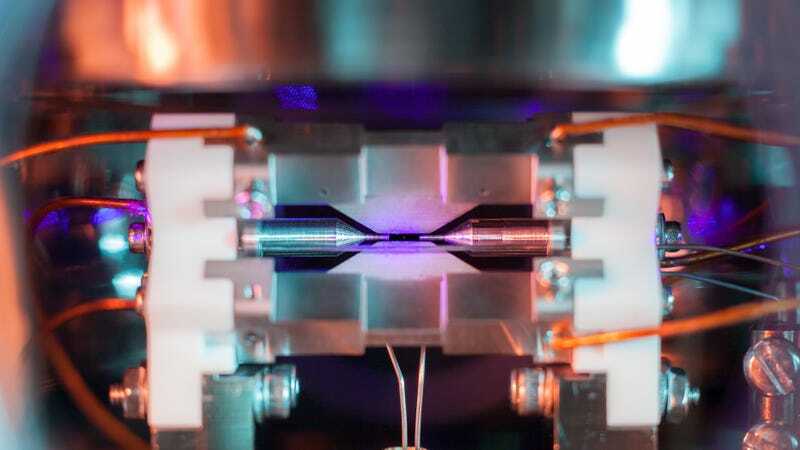 This strontium atom is emitting light after being excited by a laser, and it’s the winner of the UK’s Engineering and Physical Sciences Research Council (EPSRC) photography award. The EPSRC announced the winners of its fifth annual contest yesterday. Winning photographer David Nadlinger, graduate student at the University of Oxford, was just excited to be able to show off his research. Nadlinger traps atoms as part of his research on quantum computing. The laser light causes the atom to emit photons, which could be collected using a longer exposure. He took the photo through a window into the vacuum of the ion trap. Judges selected the photo from more than 100 entries that receive EPSRC funding—the EPSRC is the main funder of physical science research in the United Kingdom. Here are some of our other favorites. What&apos;s Your Favorite Science Photo?